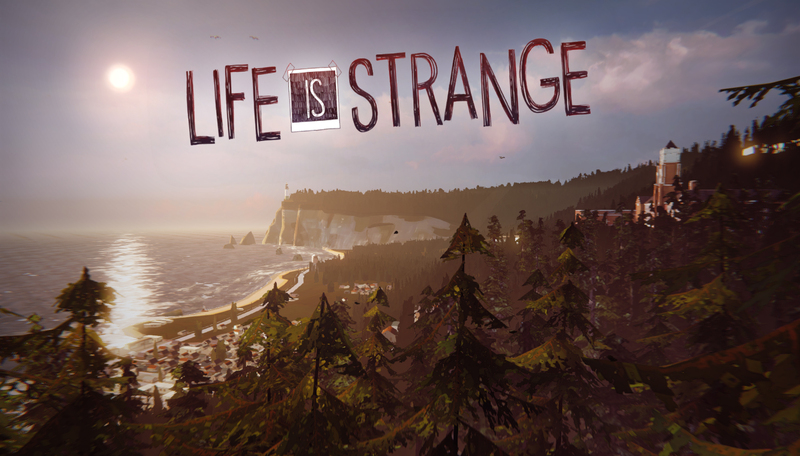 Concept: 10/10 Life is strange is a Point-and-Click adventure game with a heavy focus on story telling. It also includes branching plots and decision trees similar to those found in visual novels. The story is set in the 90s, and follows a young woman attending an art college who is insecure about her own artistic abilities, and struggling to make friends and fit in with the other students. The school is full of the stereotypical characters one remembers from their own experiences in surviving highschool (or university), such as jocks, preps, goths, hipsters, the shy people, the fat kids, the druggies, the bullies, the cheerleaders, the airheads, the geeks, the studious types, the religious types, and of course the teachers and staff of the school as well. This makes it pretty relateable for anyone who hated school or also felt like they never really fit in anywhere. Story: 10/10 It’s a coming of age story, and also a story about finding out what’s important to you, and what you must do to protect it. You play the role of the protagonist, Max, as she returns to her childhood neighborhood to attend college after being away for a number of years. Max is rather aloof and although she has a few friends in her class, she also has a lot of enemies. She sometimes has trouble focusing in class, and also she wonders if she even belongs in an art program, because she doubts her own abilities and lacks self confidence. She is asked to participate in a photography contest but she is too shy to submit her entry. While thinking of what she should enter, she is captivated by a blue butterfly in the ladies restroom. Wanting to get a pic, she turns the corner, and quickly becomes involved in something she wasn’t supposed to see. Two other students have entered the restroom and are struggling over a gun, a real gun. Max hears the gun go off, and then, her head hurts, she feels a strange power, and realizes she’s able to rewind time, to undo the events of what happened. Using her new power, she rewinds time to prevent the gun from going off. The other girl, scared but unharmed, thanks Max for her help, and the two begin chatting. It turns out that the girl was Max’s best friend when she was a little girl, but she’s changed so much that Max no longer recognizes her. The two begin to rekindle their friendship, as Max learns about the events that led to the struggle that day, including mysterious murders, disappearances, rapes, and drugging of female students from Blackwell Academy. As the story progresses, Max finds herself trying to save the girls involved in these incidents while trying to uncover the truth behind who’s to blame for the horrendous acts. On top of that, Max begins having strange visions, and strange things begin happening around town, such as snow in the summer, and dozens of beached whales, and solar eclipses, and tornadoes, and other strange phenomenon that eerily seem to be connected to Max’s new powers. As she uses her powers, sometimes other things around her change, and not always for the better, sometimes for the worse, or even heartbreaking consequences. There’s a lot of emotion and heart in this game, and your choices and decisions impact which parts of the story you will see. Characters: 10/10 Max is the player’s character throughout this game; she’s an intelligent and artistic young woman who’s just enrolled into a new university where she’s struggling to fit in. Chloe is Max’s childhood friend, they were separated when Max moved away as a child. Max did not keep in touch with Chloe due to a certain event in their past, but their paths soon cross again. Kate is one of Max’s close friends at her new school. Kate had something terrible happen to her and is now the victim of constant bullying. Rachel Amber, another student at Blackwell Academy, had filled in the role of Chloe’s best friend in Max’s absence, but then Rachel mysteriously disappeared. Nathan Prescott, is the rich spoiled boy who’s family owns most of Arcadia Bay and Blackwell Academy. Is he behind the mysterious disappearance? Appearances are not always what they seem in this game; be careful who you trust, and also don’t judge others too quickly until you know them. They may surprise you! As mentioned above, the characters feel very relateable because they’re based on all too common, but all too true, stereotypes of the types of students one has encountered in their own life. Gameplay: 6/10 Gameplay consists of wandering around the school or town looking for clues, by finding objects that you can interact with or talking to different people. Many objects have multiple ways in which to interact and the game does not hold your hand or make it readily apparent which options are best for which objects. At times, your actions, decisions, and dialogue will impact the past, present, or future, and you will be notified by a blue butterfly icon on your screen. You can then either rewind, or proceed and live with the choices you’ve made. Although the gameplay itself is fun, there are some MAJOR gameplay issues with this game when it comes to control, usability, and interfaces. I play on a “gaming” laptop machine. I don’t have a mouse, nor any place to really put a mouse, because I play from my bed. Using the touchpad OR my touchscreen with this device is a nightmare for some reason. Also when I first got episode 1, maybe it’s just me and I’m really dense, but I spent over 4 hours trying to do the first action, and stumbled through the game for days, until I realized one thing – I was trying to “trace a path” to the action I wanted to take, following the little arrow that’s drawn by every object. This is wrong! Instead you just click below or left/right/above etc for the action you want. — This made control somewhat easier BUT the main thing I find is I have to be facing/looking at an object JUST right in order to “reach” the action I want to click on, sometimes I have to back out of the action tree and reposition the items on my screen – I think this probably doesn’t happen when using a mouse – but I can’t be the ONLY gamer who doesn’t use a mouse, especially with a game like this which doesn’t require much user input. Music: 8/10 Music plays a big part in this game; with the ability to sometimes sit and listen to a music cd or play your guitar, and you can just relax and immerse yourself in the soundtrack. The soundtrack is also fitting for the game, and has an “indie” feel to it which matches the “hipster” vibe of the game’s settings and characters. Voice Acting: 10/10 The game is fully voiced, and the game relies on this mechanic to tell its story to the audience. The voice acting is also quite well done; in fact, it’s been nominated for Performance of the Year in the Golden Joystick awards for the voice actress behind Chloe. Graphics: 7/10 I enjoy the graphics of the game, and it’s fully animated and fully 3d, presented to you like a movie. They’re not the most highly advanced cutting edge graphics ever, and other reviewers are quick to point out some lip syncing inconsistencies (which I personally haven’t noticed). But I think it’s still a pretty game to look at :). The number of environments that you get to interact with are rather small, the school, a diner in town, a scrapyard, your friend’s home, and the dark room; but this is an indie game, so it’s expected to be somewhat small in scale. I think the outdoor scenes are especially lovely. Character design is also very good, although the characters feel a bit stiff at times. Replay Value: 8/10 Your decisions really do matter; For example, Kate Marsh really can die if you don’t save her. I saved her in my game, but I did some research while typing this blog post to see if the decisions we make in the game actually matter, and a lot of people are asking for help how to save her, etc. Also they say it’s one decision that you cannot rewind and redo; so unless you save before then, or start all over, you’re stuck living with the consequences of your actions. — However, so far, every episode has followed the same story and reached the same climax; although what happens in between the beginning and end IS dependent on your actions, as illustrated above, you will still arrive at the same conclusion each episode so far; though there may be multiple endings as it is advertised as such on steam – we won’t know for sure until Episode 5 arrives.